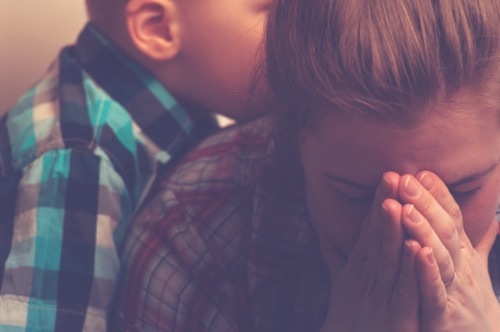 Feeling worried or blue once in a while is normal, but what should parents do when emotions continue to get the better of them — or their kids? Seeking counseling when needed is the best step a parent can make toward wellness for themselves, their kids and their family. So, how do you know when normal worries become too much and professional help is the next best step? Oftentimes, symptoms manifest physically, as disturbed sleep or aches and pains like a stomach ache or headache. This could indicate the need to seek therapy. Also, extreme changes in behavior — overeating, not eating enough (exhibited by a dramatic weight loss), or nervous behavior like picking at your skin — could be signs of mental health issues that warrant further attention. “The rule of thumb many providers use is having the individual ask themselves whether or not what they are experiencing is impairing functioning,” says Dr. Geoffrey Putt, clinical child and adolescent psychologist at Akron Children’s Hospital. One may notice problems with relationships, work or other important areas of life. “If depression is making it hard to get out of bed, complete tasks which used to be fun or easy to do, or having an impact on appetite or sleep, then these are all signs that it is time to seek help,” Putt says. Life does not slow down and busy parents certainly do not have the time or energy to add yet another thing to their “to do” list. So why is it important to seek help? The best time to hit pause on our harried lives and provide self-care via counseling is the exact moment you feel like it’s the last thing you can add to your already full plate. Carving out time for therapy is worthwhile. “It is important to seek help for children and adolescents in efforts toward early intervention, but also as a parent toward creating a healthy environment for your children,” says Lauren G. Wright, LPPC-S, director of community-based services at Crossroads, a provider of behavioral healthcare. Admittedly, doing something new is scary. Going to a counselor or therapist for the first time could be so far outside of your comfort zone, it’s enough to keep one from getting help. One can find solace in knowing a good counselor or therapist is already aware of this and can address worries or fear about being new to therapy with you. “Being open and honest with the counselor or therapist about one’s feelings can start the dialogue and start building the trusting relationship to lay the foundation for continued therapeutic work,” Wright adds. Most importantly, every parent wants to do the best for their kids, but a parent’s mental wellness impacts their children. Parents and primary caregivers are children’s first role models. The best way to teach children how to manage their feelings is having them see their parents deal with the same issues themselves. “A child doesn’t need to see perfection,” Putt says. “They need to see, in spite of it all, you use tools and strategies to manage the bumps and smooth the road enough to navigate life. No journey is without bumps. But the difference between a bump and a road block is how one chooses to see it and what they choose to do about it.